VetIQ® 2in1 Denti-Care Granules is a unique blend of natural ingredients, which works with your pet’s natural cleansing mechanism to reduce oral bacteria and freshen your pet’s breath. VetIQ® 2in1 Denti-Care Granules also contains seaweed which helps normal salivary gland function whilst reducing oral bacteria. Natural antioxidant pomegranate extract supports immune function and peppermint oil freshens your pet’s breath. Ingredients: Seaweed meal, Brewer’s Yeast, Natural Flavouring, Pomegranate Extract (Punica granatum), Peppermint Essential Oil, Parsley Seed Essential Oil. Additives (per kg): Sensory Additives: Natural Flavouring, Punica granatum (pomegranate extract) 1000mg, Peppermint Essential Oil 1000mg, Parsley Seed Essential Oil 250mg. 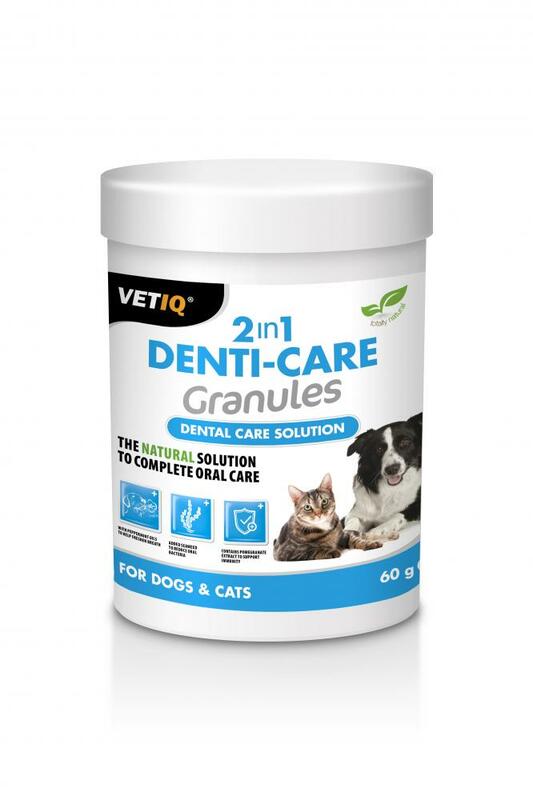 There are currently no questions for VetIQ 2in1 Denti-Care Granules - be the first to ask one!